Best place to share and enjoy the most awesome images! Imgur is the best place to share and enjoy the most awesome images on the Internet. Every day, millions of people use Imgur to be entertained and inspired by funny, heartwarming and helpful images and stories from all around the world. Amazing online image sharing community! Imgur was founded in 2009 by Alan Schaaf in his Ohio University dorm room as a simple, no-limits platform to share images online. With the launch of the homepage gallery, Imgur gave its community the power to refine its many images into a showcase of the freshest, most interesting and popular images on the web. These images can be hilarious, cute, inspiring and informative. From stories of personal transformation to current events, pop culture, memes and more, Imgur has an image for everyone. Of course, there are plenty of cute puppies, too. 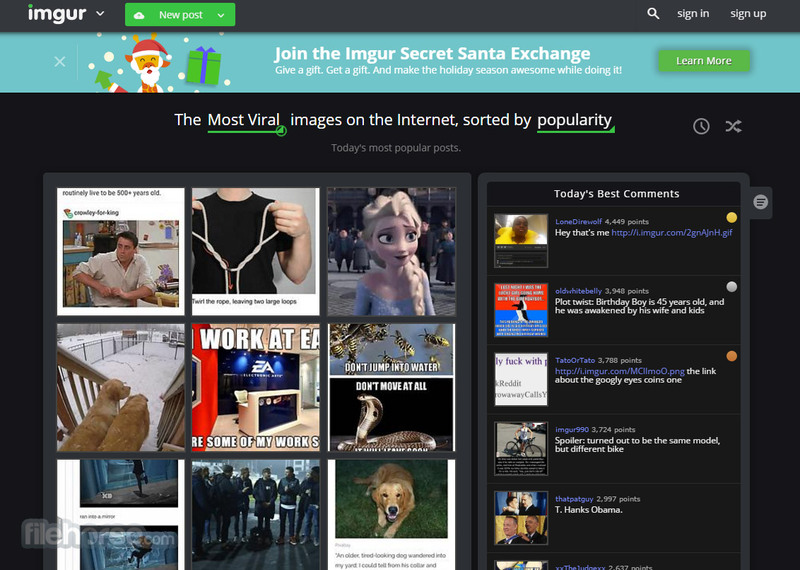 Each month, images on Imgur are viewed across the Internet billions of times. It is currently ranked one of the top 50 largest websites worldwide. Instantly share your images and galleries online! Many of the internet users separate online image hosting service into three categories – gallery management services like Picasa or Flickr, social-based services like Tumblr or Instagram, or simple “drive by” image hosting services like Imgur, Tinypic, Abload and many others. Even though this last category often offers the least amount of long term services, hundreds of millions of people all around the world are each day in need to just take some picture they have, upload them to web and immediately get URL code of the hosted image that they can use in their communication with other people. Among these services, Imgur managed easily to distinguish itself by offering stable hosting, good feature-set for free users (no registration required) and easy to master interface that was enriched with little gallery management tools for those who are little more ambitious. Imgur is a popular image hosting website from United States that after its launch in 2009 very quickly managed to achieve worldwide fame as one of the most stable, easy to use and highly competitive image management services for users of all knowledge levels. By managing to mix quality service for free users (who can easily use this service to host up to 250 images, create new memes with the simple integrated editor, public galleries) and removal of all limits for paid users, Imgur very quickly managed to find itself in the top-50 most visited websites in the world (and #20 in the United States), serving millions of users and providing image sharing service that is currently embedded in billions on websites, forum posts, social network pages, chat steams and more. Amazing online image sharing community! 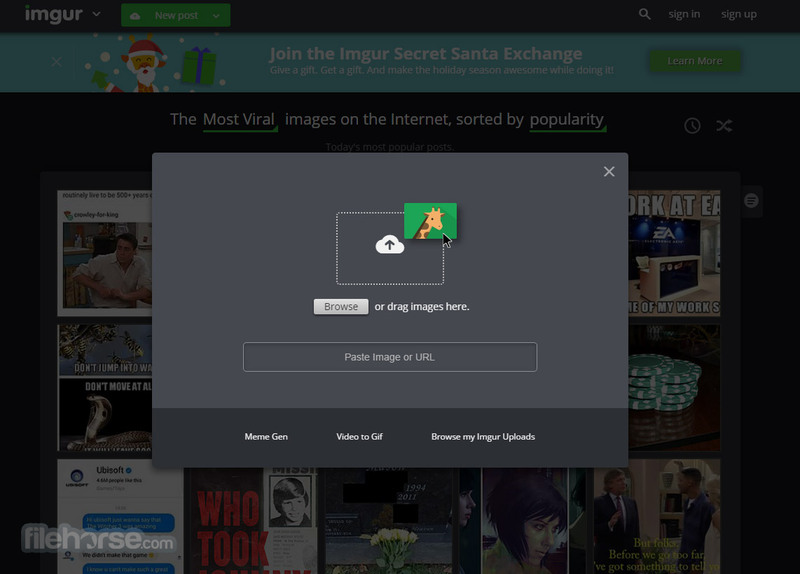 Every aspect of the Imgur service was streamlined to enable easy service to computer users who are in need of sharing images over web. Images can be uploaded from local storage with integrated file browser, from URL, by dragging and dropping image into browser window or by pasting the image from clipboard using Ctrl+V command. That image will immediately be uploaded, with options to give you the option to make that image part of a public gallery, put it in an album of your choice, and 10 more ways to share it over the web (URL link, embed code, markdown link, BBCode, HTML embed code, and direct sharing buttons for Facebook, Twitter, Pinterest, Google+, Tumblr, Reddit and more). Interface of Imgur uses now well-known dark color scheme that houses simple tools for image uploading, gallery and album management and sharing. Users who visit this site will have zero problems figuring out how to easily upload images. 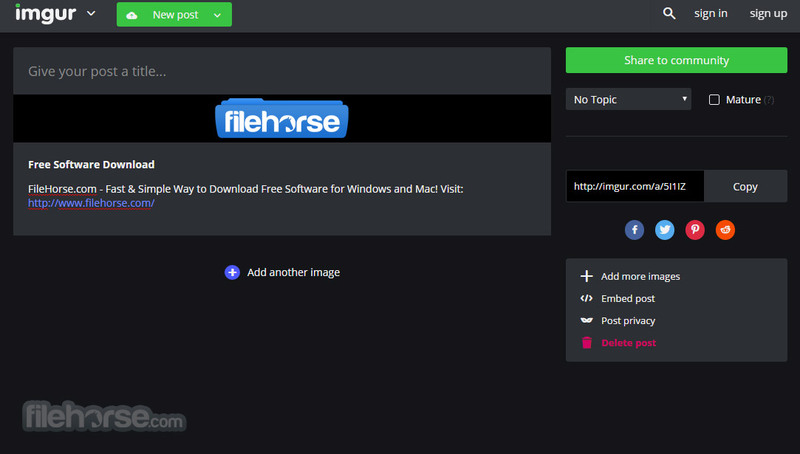 Main upload are situated on the top-right side of the main page, leading to the post-upload screen that will instantly give you full breakdown of all image sharing links. Gallery and Album management is also handled very well. Imgur can be used for free without registration with few limitations (up to 250 images hosted, oldest images will be deleted when new ones arrive). All limitations are removed if user pays for Pro account. After forming in 2009 with the efforts of Alan Schaaf, this website blossomed into profitable company and top-50 most visited website in the world that continues to this day to give free and unregistered users a great service that they keep coming back to day after day. Amazing online image sharing community!